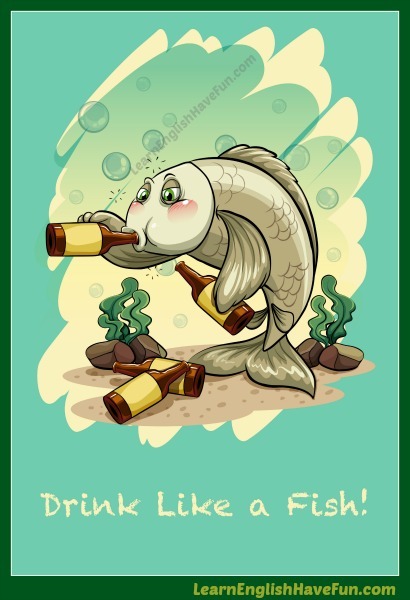 Drink like a fish: to drink too much alcohol at one time. My girlfriend drank like a fish when I brought her home for dinner to meet my parents the first time but they understood she was just very nervous. I'm worried about Paul—he's been drinking like a fish again. You should come on over—we're having a great time and the cocktails are only $3 during Happy Hour so everyone is drinking like a fish. Did you really have to drink like a fish at my office holiday party? I'm so embarrassed to go back to work on Monday. The flight attendant said she won't serve us any more drinks because you've been drinking like a fish. I hate going to fraternity parties—it's not very fun when I'm sober and everyone else is drinking like a fish. Give me your car keys. You've been drinking like a fish so you're not driving yourself home tonight. I admit I drank like a fish in high school but by the time I got to college getting drunk wasn't much fun anymore so I stopped. I'm so glad it's Friday! It's been a long and stressful week so I'm going to drink like a fish tonight! I discovered nearly 350 beer cans under my son's bed—that means he's been drinking like a fish since he came back from rehab. Drinking like a fish is bad for your health and bad for your wallet. The first—and last—time I drank like a fish was at my sister's wedding when I was just 15 years old and I made a complete fool of myself. We're really concerned because Sam's been drinking like a fish at least 4-5 nights each week. It was hysterical to see your grandmother drink like a fish at brunch—she sure does like Bloody Mary cocktails. 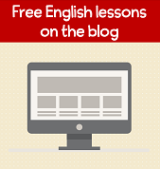 If you found this idiom useful, please sign-up for my free newsletter so you'll be able learn about new updates to my website. If you don't practice using new vocabulary, you're not likely to remember it. If you say you want to learn to speak English then start practicing it—this is an excellent opportunity to do so.